Bear Grylls Compact Multi-tool. 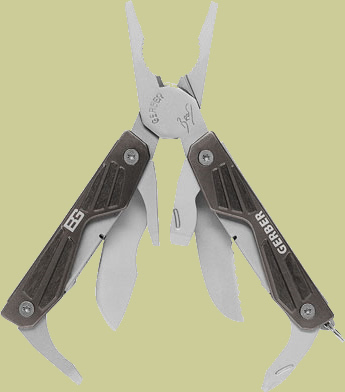 The Gerber Bear Grylls Compact Multi-Tool model 31-000750 is only 4.3 inches long when open. Do not let that fool you, though. This little beast has 10 external components including two full size blades, fine edge and serrated edge. The complete list of all 10 components are needle nose pliers, small flathead screwdriver, wire cutters, medium flathead screwdriver, fine edge knife, serrated edge knife, lanyard ring, bottle opener, phillips screwdriver, and tweezers. The compact size is ideal for placing on a keychain, or you can comfortably carry it in your pocket. Priorities of Survival pocket guide is included with every purchase.